You know I have been swamped and am feeling just a little bit tired. However, it is a good type of tired–the kind that comes from being out in the outdoors and getting satisfaction from what you do. I have a couple of animals in boot camp–and they are finally making progress after five days of intensive work. Doggie DI Boot Camp animals are the worst of the worst…so I am glad to see some progress! Above: Gorilla Marketing Big Bear Style! 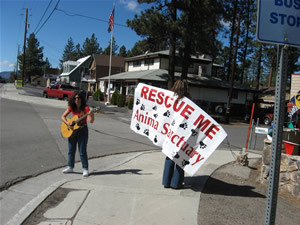 Shakeh (a performer from Los Angeles) and our own Kim Chartrand hit the street to strum up some attention. Of course, I had to join them. Soon the hard work paid off as Ron Seymour from Channel 6 turned off the boulevard to film the hard efforts. Pam has been on the mountain for a year and a half. 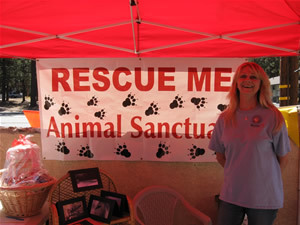 She envisions a rescue sanctuary for pets up here on the mountain and reports that Rescue Me has obtained a 501(c)3. 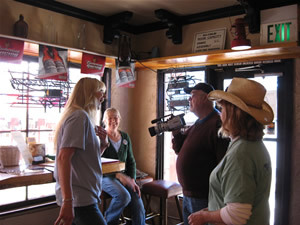 Above: Ron Seymour interviews Pam Murdock for Channel 6 Television. I had to leave after an hour and a half but keep your eyes out for coverage on Channel 6 this week. Pam says she has another fundraiser down in Brea (where she used to live) next month. This entry was posted on Sunday, October 14th, 2007 and is filed under Uncategorized.